The ever-expanding size of the world wide web has caused an explosion of content in different horizons. Be it the case of videos, music, or text-based content, billions of netizens gobble loads of content every day. There is an uncountable number of websites ready to feed you with the daily dose of their interesting articles. You can count us in the list if you want. But how would single human visit tons of websites to slurp all the information? Thankfully, there are ways to so. If you get out of the world of Facebook’s News Feed, you realize there are alternatives like Google News and Microsoft’s most recent offering. But the thing with these news aggregators is they are the ones who get to decide what should appear in front of your eyes. That’s where RSS feed comes in, giving you a unified way to get the latest updates from different sources in one place. There is hardly any content-based website that doesn’t include the button that asks visitors to subscribe to RSS feed. RSS, short for Really Simple Syndication or Rich Site Summary, was designed to make it easier to transfer information between different websites and to the user in a form that easily readable for both computers and users. This process of transfer of the information is called web syndication. An RSS feed can be used to push anything from text, images, videos, GIFs, and other multimedia content that’s available on the web. But how to access an RSS feed? The tool required is known as RSS reader, and there are plenty of them out there. An RSS reader can be in the form of an app, a website, or the one delivering feeds via email. Its job is to look in the RSS directory for the latest content submitted by the source a user has subscribed. 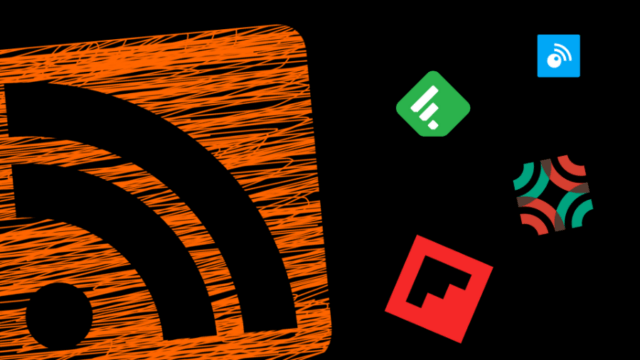 In this post, we are going to discuss some great online RSS readers that pack tons of features and remain in the good books of many people. When you get started with the internet, the first thing you know is Google. 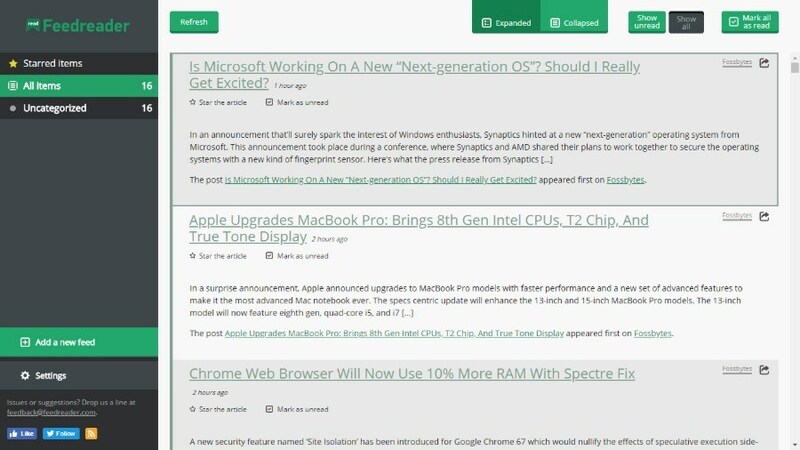 After being in existence for a few years, Feedly has a similar reputation in the world of RSS feed readers. One thing that should matter a lot in the case of RSS readers is the UI because the purpose is to consume content as quickly as possible. And Feedly doesn’t disappoint on that part. Personally, I like its mobile app more because my focus on a particular headline is better. You can easily subscribe to the RSS feeds of sources and blogs across different genre. If you want, you can club multiple sources feeds under one collection to get their feeds together. Feedly also lets you add mute filters to separate unwanted posts and follow specific keywords. One thing you’d like about Feedly is the number of third-party app integrations it provides. Sharing content on other platforms like Slack and Trello is a breeze. Other standard features include Read Later, search bar, personalized feed, etc. 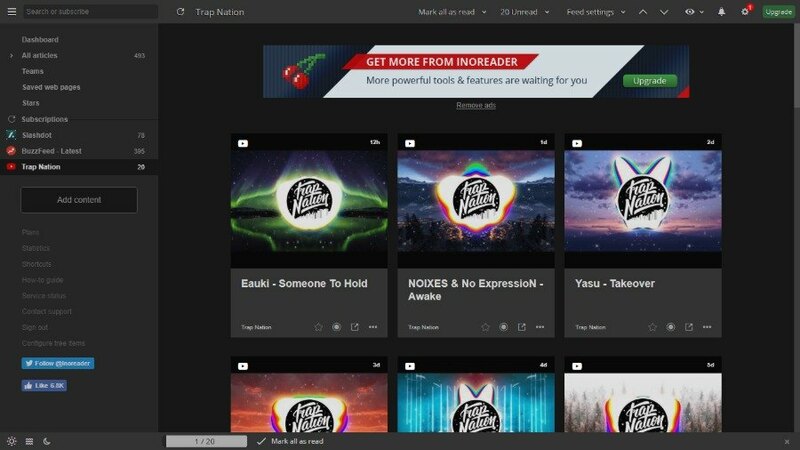 Feedly is available both as a free RSS reader and as a paid one which unlocks some limits on the number of sources and collections you can add among various things. It’s name is The Old Reader but this free RSS reader packs a lot of modern stuff that one would expect from a robust feed reader. The Old Reader came into existence around the same time when Google pulled the plug on their Reader back in 2013. Since then it has gained a lot of popularity. By clicking Add A Subscription, you can easily add RSS feeds from your favorite blogs and websites. In addition to keywords, you can also paste feed URL for the source you want to subscribe to. In the web version, the way the feed entries are displayed is good. Still, there is a scope of improvement as you can easily spot alignment issues. The Old Reader lets you connect Facebook and Google accounts to know what your friends are reading. You can also import RSS feed from other platforms by uploading an OPML file. This online RSS reader has a free version which offers only ten subscriptions. The Premium version removes ads, improves feed refresh times, increases your subscription limit, etc. Another online RSS reader that inspired by the demise of Google Reader is Inoreader. In terms of look and feels it has resembled other RSS feed readers out there with the navigation pane on the left-hand side. However, the difference is it displays stories with card style view as default. If you don’t like it, you can change the view by clicking the eye button in the top-right corner. You can subscribe to your favorite blogs, news portals, Google+ feeds, Twitter users, and other websites. A salient feature offered by this online RSS reader is the search bar where you can type keywords or enter an RSS feed URL. But it does more, for example, when you type Fossbytes in the search bar, it’ll show the post related to Fossbytes in a drop-down menu. That’s quite handy. 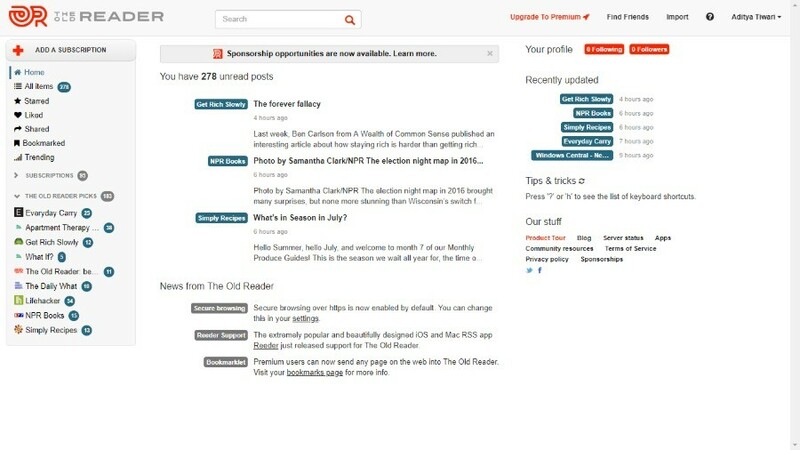 Apart from the free version, Inoreader also offers several paid tiers with varying perks. You can choose between Starter, Plus, and Professional. 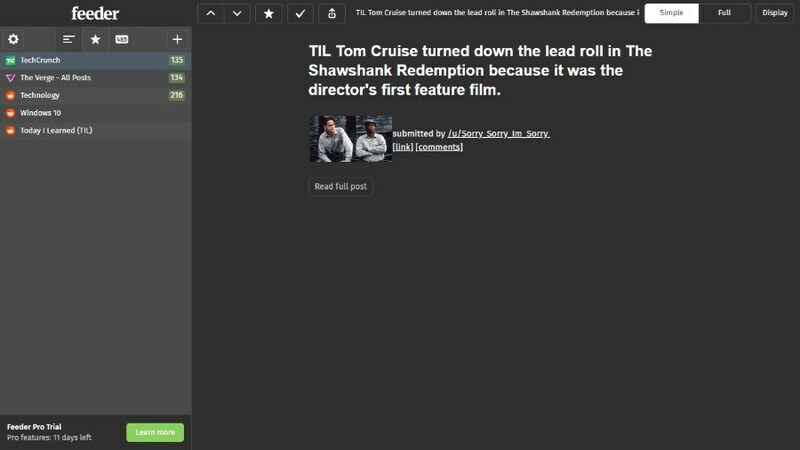 Another RSS reader to consider is Feeder. 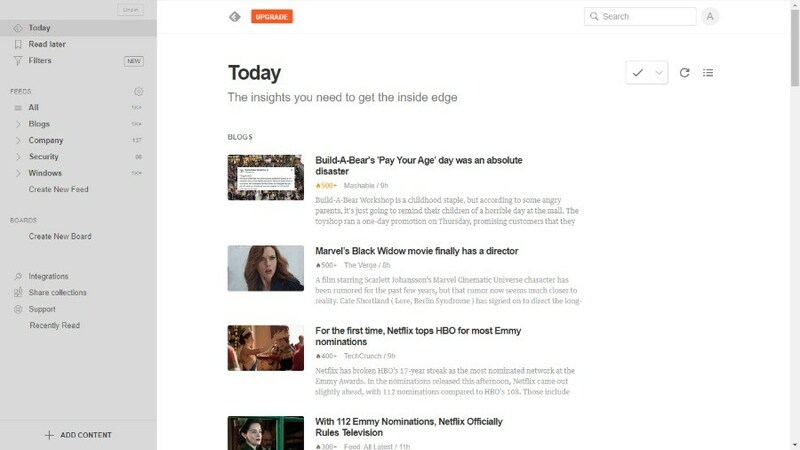 With its compelling and intuitive user interface, Feeder is even easier to use than Feedly. It comes with support for integrations called Power-ups including Gengo, Upwork, and the helpful Feeder Dashboard which improves productivity by adding up to 10 columns of RSS feeds. On the web version, you can use the up and down arrows to quickly browse through stories. There is one thing I like a lot, in Simple view, you get to see just the text and multimedia content. There also exists a Full view which displays the entire web page in the RSS reader itself. Similar to other RSS feed readers, you can add an RSS feed by typing the website’s name or pasting its URL. The subscribed feeds can be arranged into folders and sorted with the help of filters. Also, you can import and export feeds to OPML files. One of the best RSS reader apps is Flipboard. With its magazine-style interface (called Smart Magazines), it provides a different experience than other RSS feed readers you’ll find. It may not be assorted as Feedly, but you see stories from a different perspective. By visiting the section called ‘What’s Your Passion,’ you can follow your favorite topics and interests. It’s more of a news aggregator but you can transform your daily RSS feeds into a beautiful magazine to delight your readers. You can also add content created by others in your magazine. Flipboard provides analytics insights including viewer count, page flips, etc. A magazine can be limited to yourself or shared with the general public using Flipboard. This is also one of the best RSS feed readers that has been in existence for more than a decade. Earlier, Feedreader was available for Windows OS, but now it has transformed itself into a web-based feed reader. 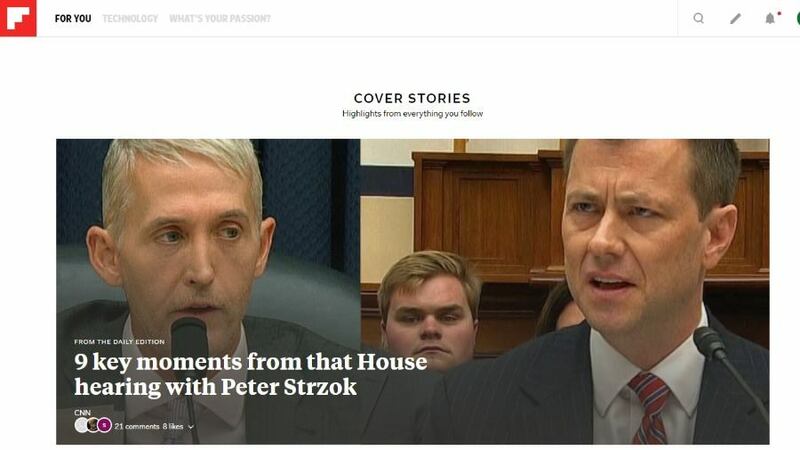 The way this RSS feed reader presents the stories from your feed may not be the best but you can clearly read the headlines as you quickly scroll down the screen. That’s a plus point. There are some viewing options available. You can create categories for RSS feeds, export and import them, bookmark feeds, etc. Feedreader also provides a bunch of helpful keyboard shortcuts that can make things easier. One thing that you’d like about it is the price tag – it’s free. Another version of this RSS reader exists called Feedreader Observer which works differently. So, these were some great RSS feed readers that you can give a try. Choose the one you like and start consuming your favorite stories right away. In case you’ve some other RSS reader to suggest, drop your thoughts in the comments.